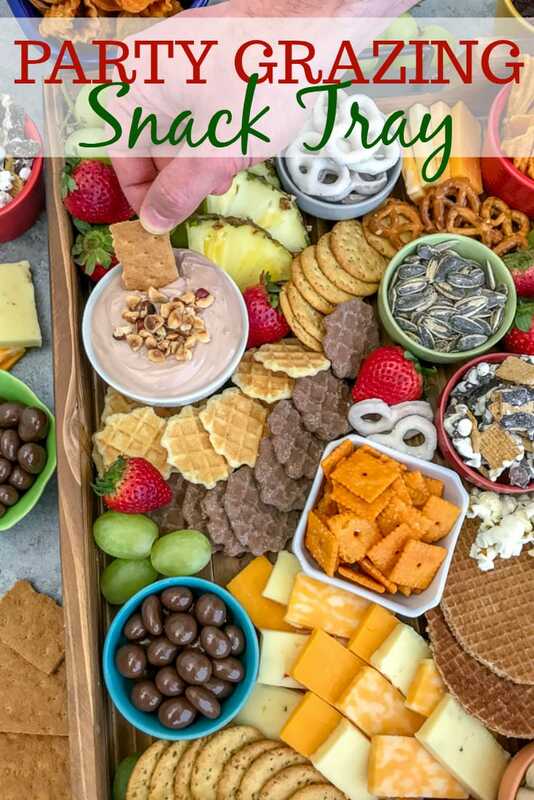 This Party Grazing Snack Tray is filled with delicious snacks that both kids and adults will absolutely love. Very easy to put together, no cooking required and guaranteed to be picked clean! Comes together in around 20 minutes and is perfect for any game day or party. With football season in full swing and the Super Bowl upon us, party platters and trays such as this are a great way to feed your guests! Providing an abundance of different flavors, both salty and sweet, will nail two birds with one stone. Let’s not forget to mention how simple this tray is to put together. All you need is a large serving tray, a few small ramekins, and an array of different snacks. They can be anything you prefer or you can copy this board snack for snack. 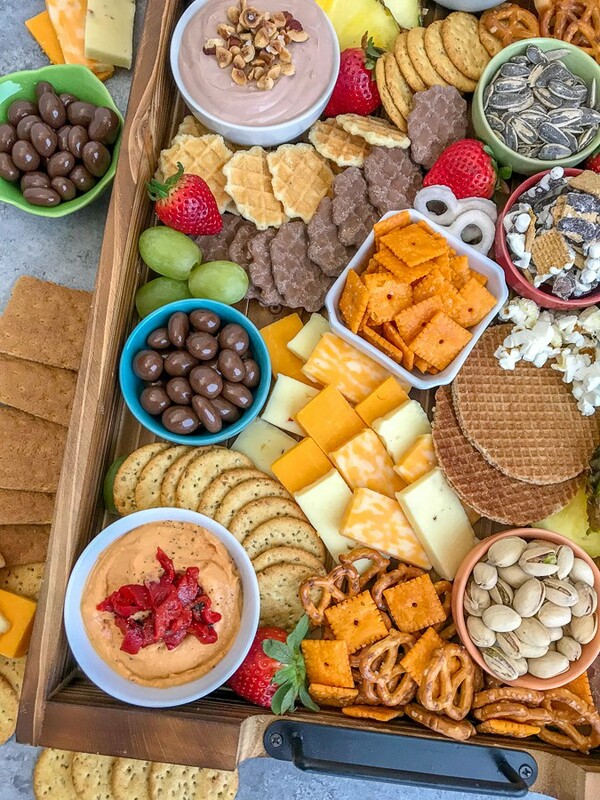 Don’t allow yourself to be intimidated by the idea of putting together a party tray. They are super simple and actually quite fun to put together. Especially if you’re the creative type (like me) that likes to put together pretty patterns, stacks, and colors. 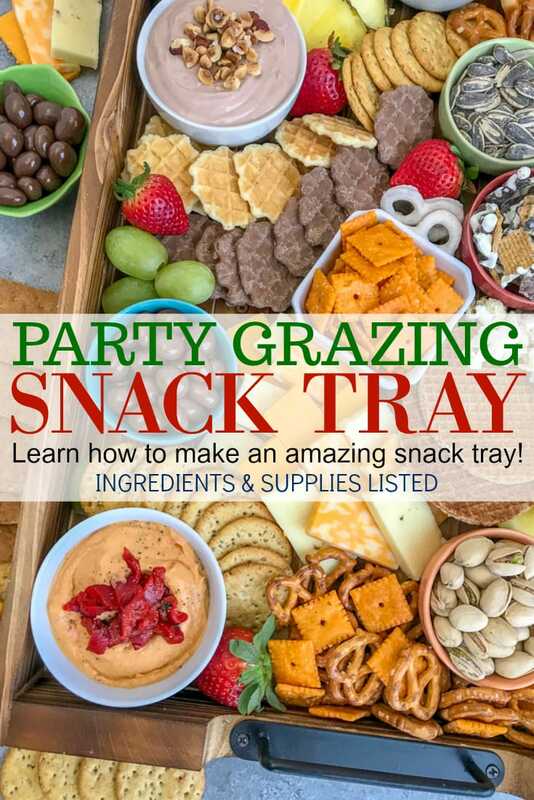 I am going to lay out some basic essentials for putting together your very own epic Party Grazing Snack Tray with the exact snacks and tools you need to serve them. BOARD/TRAY: If you don’t have a tray, use a cutting board or platter. You can use any form of a platter or tray to serve these snacks on. Just make sure that it is on the larger side. The one photographed is 20 inches wide by 14 inches deep. So it can hold a ton of goodies! This rustic torched wood serving tray is the one that I have and I love it. It works great for party trays, as well as an ottoman tray to hold beverages, remotes, etc. RAMEKINS/BOWLS: I recommend serving snacks, dips, and sauces in small ramekins, as they take up the least amount of room on a board, giving you plenty of room on your tray for other snacks and dips. I have a mixture of 1/4 cup size down to 2 ounce capacity on this board. The 2 ounce pinch bowls pictured are great for nuts, seeds, or any small finger foods. HEALTHY & INDULGING: I find it essential to cover all bases when it comes to putting together a party tray. Don’t forget to appeal to friends and family that are looking to indulge and those who prefer to keep on the lighter side of things. 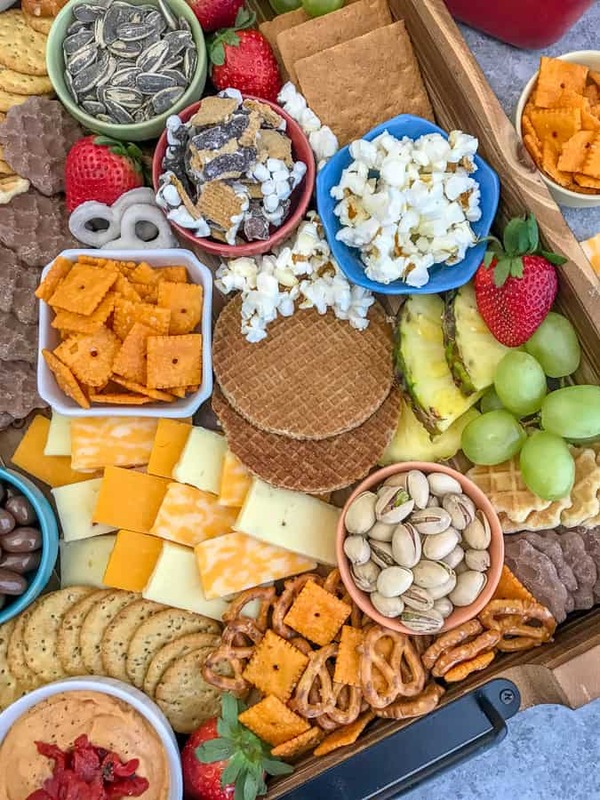 For healthier snacks, I recommend dried fruits (fruit only ingredients), hummus and crackers, an array of fresh fruits, and salt-free popcorn. CHEESE & CRACKERS: Don’t forget to include these two items! They are essential to any party tray. You can take the easy route and buy the cheese already pre-sliced and toss it on the tray or, if you’re like us, we don’t mind slicing or cubing the cheese, as it is cheaper to do so. BEVERAGES: Although not pictured, our favorite drinks to serve are sparkling waters, fruit-infused waters, and of course – beer and wine. Because a party with friends and/or family is not complete without some indulgence. Right? 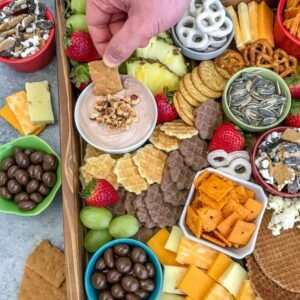 Below is a list of everything you see on this party platter so that you can easily and successfully put one together for your upcoming gathering! SWEETS: Chocolate covered peanuts, Mama Mellace’s S’mores Snack Mix, dried cranberries, yogurt covered pretzels, Regular and Chocolate Stroop Waffles (such as Belgian Boys– these can also be found in stores with other crackers and cookies), graham crackers, hazelnut yogurt dip, and Caramel Stroopwafels. 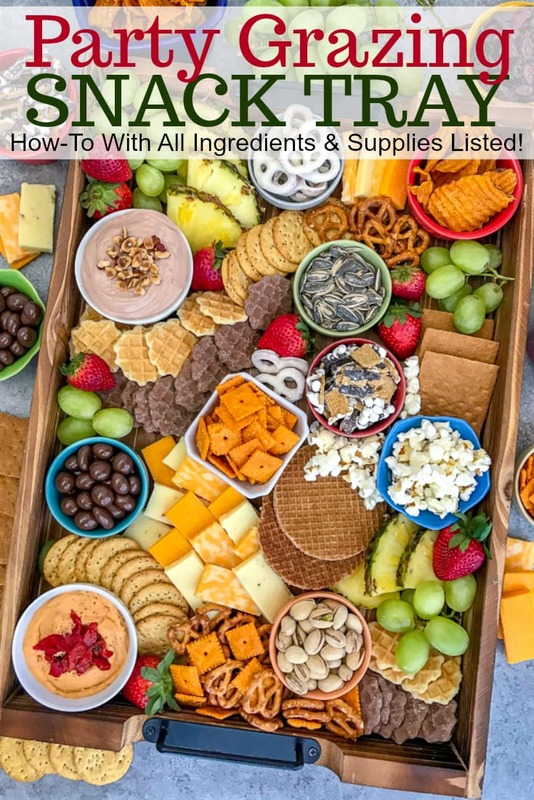 SALTS: Sweet potato chips, multigrain crackers and roasted red pepper hummus, sliced cheese (pepper-jack, sharp cheddar, and colby), cheese crackers such as Cheez-it’s, pretzels, unsalted popcorn, pistachios, and sunflower seeds. FRUITS: Grapes, strawberries, and sliced pineapple. Have a favorite you don’t see pictured or listed? Grab it when you’re out and about getting the rest of the ingredients. Get creative. If you have little ones that are going to be at the party – get some cookies or other candies! So you bought the board/tray and you’re finally home with all of the ingredients scattered on your kitchen table. What now? At first you may feel overwhelmed and wondering how you could possibly put a pretty board together without it looking like you were blindfolded when putting it together. Relax and start with the ramekins and work from the corners. Fill the ramekins with the dips and small items: peanuts, seeds, nuts, popcorn, etc. Start from the corner and work your way out a little. As you can see pictured above, I placed the hummus bowl in the corner and started layering the ingredients that would go with it all around the bowl and worked my way out. Next, work from the opposite corner and layer towards the other side. Scatter the bowls a bit, but also keep ingredients that are meant for certain dips relatively close to one another. Don’t fill the whole board with bowls. Scatter piles of crackers, pretzels and such around on the bare board. Scatter fruit in corners and open spots for a spot of color. Fill in any gaps with smaller ingredients. Don’t forget your garnishments for dips! I garnished the roasted red pepper hummus (store bought) with extra diced roasted red peppers and the hazelnut yogurt dip with chopped hazelnuts. If you have leftover ingredients to serve, use extra ramekins and fill small bowls to place around your board or tray. 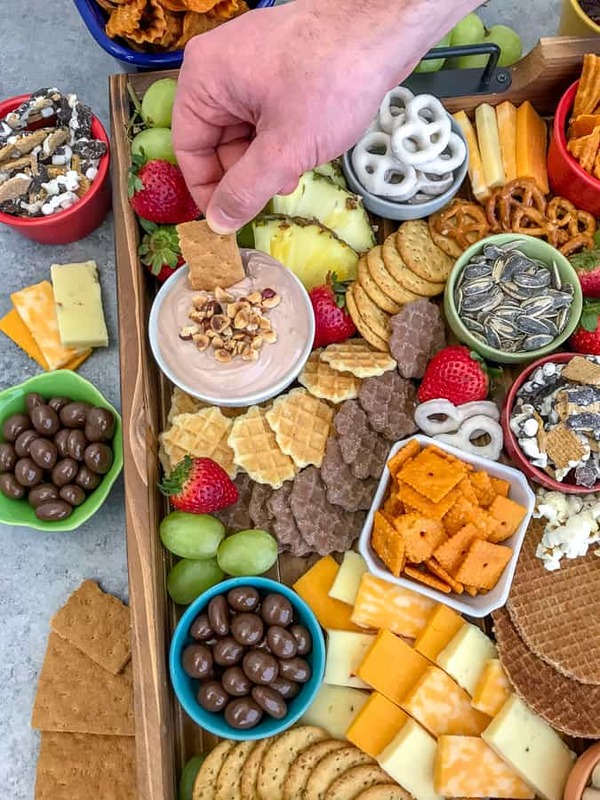 This snack tray comes together so easily! 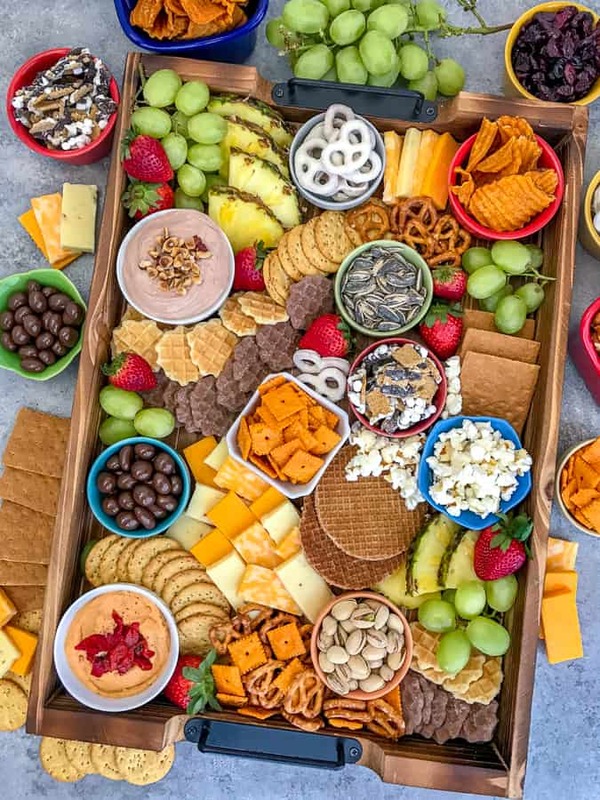 Learn how to throw together the perfect party tray that is guaranteed to wow all of yours guests, as well as end up picked clean. Prepare, slice, mix and assemble ingredients onto your tray. If looking for helpful tips, see my blog post above for assembly guidance!